To be honest I had lost so much interest in the project by that point, that I probably would not have finished it had I not A) been determined to finish another script, any script and B) lost half the project when my computer was stolen in February and rewritten it from memory (I mean at that point you have to finish it). My overall disinterest with the project was two fold. First, being a struggling writer who has yet to sell a script, I recognized the project’s complete lack of marketability. I knew this when I started on the project, and at the time was okay with it. The idea at the time was to write a script that inherently would be very cheap to make, so cheap in fact, that I could possibly secure financing for it and make it myself. 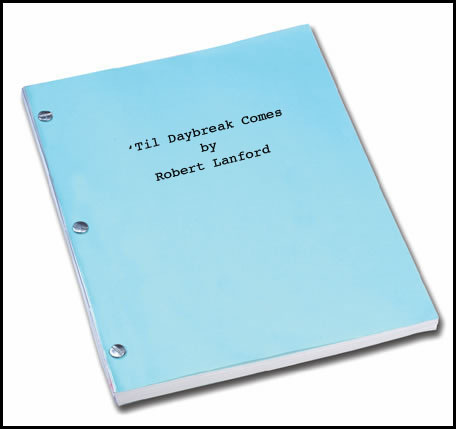 The problem was, by the time I finished the script, I was sick and tired of being a writer who has yet to sell a script, and thus was a bit disgusted with myself that I had just spent five months writing something that I could not use to generate money for myself. I’m sure you are say to yourself, well why didn’t you just pursue making the film yourself as you originally intended? Which brings me to reason two of why I lost interest. The script was no where near ready to be made into a film. A major character’s story line needed to be completely rewritten and having not written an outline, I had left several story lines feeling very disjointed or otherwise unfinished. Overall, the project just lacked polish. So, while I was ecstatic to finally finish a second feature length script, a set it aside in May and decided to work on a project with more commercial appeal. I did send a copy to my eldest sister and my brother, but otherwise I did not share the script with any one. It probably would have stayed that way too, except for a few key developments. First, my friend Marco kept jabbing at me for never sharing any of my scripts with anyone. Which I agree with him, if all my writing never sees the light of day, then I’m not much of a writer. However, I had not finished any of my more commercial script ideas since May. I had started on a superhero project, but gotten sideline by video editing. Then I started on a zombie flick, but lost interest due to the over saturation of zombie movies currently on the market. Then just recently I finally got some traction on a Jason Bourne style action film. All of these projects are still a long way off, and I needed to share something with Marco now. Despite my disinterest in May, I had always liked the core of Daybreak’s story and connected with its best moments emotionally. Initially, I decided that I was just going to go through and clean up the formatting, typos, and spelling errors, because until this was done, the script was in no shape to be shared with anyone. Once I started reading back through it, however, I realized that it really wasn’t half bad. Sure, the one character still needed to be completely rewritten, and yes, there are plenty of places that could use some more polish. Themes and character arcs need to be patched together better, but overall, I was really surprised at the quality of it. I really did not remember it being this good (and obviously I’m biased and you may not agree). The dialogue is some of the better dialogue I’ve ever created, the descriptions are vivid, crisp and clear, and the overall story is engaging and kept me turning pages. Sometimes, I guess, when we work on projects for so long and are so close to them, we get to a point where we can no longer tell their quality. We really don’t know what we have, and we suspect that it’s not very good. Sometimes all we need is a little bit of time. Time to forget, to create distance. Time to let the project just be, before we can come back and truly judge the project on its own merits, instead of our perceptions of it. If you have a similar project, I encourage you to go back to it. Reread it, now that some time has past. Maybe you’ll find that it is not as far beyond repair as you initially believed.